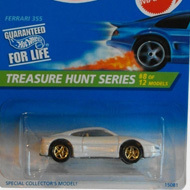 7/12 from the 1996 Treasure Hunt series. 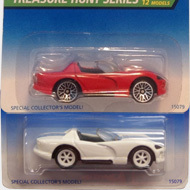 The Chevy features purple metalflake paint with a gold Hot Wheels logo on the windshield. It features purple tinted windows, a clear purple interior, Real Rider wheels with Goodyear tires, and a chrome plastic Malaysia base. This iconic car made its debut in the 1977 Flying Colors series. This is the Chevy’s first of several appearances as a T-Hunt.